Brake Service and Repair – Is It Time For A Brake Job? The brakes on your car dictate whether or not your vehicle can be safely driven on the road. Without properly functioning brakes, your safety and that of your passengers will be in serious jeopardy, which you surely want to avoid. Safe driving begins with maintaining your vehicle’s brake systems, and keeping your car’s brakes in top condition requires a brake repair shop you can trust and rely upon. We understand that finding a brake job provider for your vehicle is something to be taken seriously, with so much hanging in the balance. When you’re searching for the best brake repair Tempe AZ has to offer, you need look no further than Elite Auto Repair. 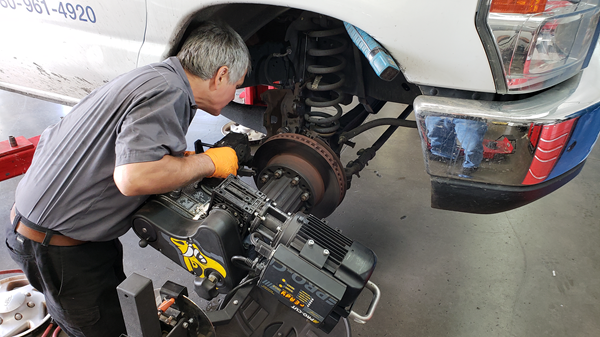 We offer brake service that includes brake replacement and brake repair that’s always completed by our ASE (Automotive Service Excellence) certified technicians, who you can trust to get the job done right the first time around. Don’t Wait Too Long For Brake Repair! Some car owners don’t realize that waiting too long to have their car’s brakes repaired can do damage to the braking system in their vehicle, which leads to additional repair costs that could have been avoided if they’d taken action sooner. Likewise, we advise our customers to pay close attention to any sounds their vehicle makes, which is an early indication that service is needed. For example, your rear brakes will begin to make a light squealing sound whenever they’re engaged when it’s time for the rear brake pads to be replaced. In this event, you should have the brake shoes replaced as soon as possible to avoid wearing through the shoes to the metal rotors or drums, which will lead to a very costly repair. Whether you have the need for an emergency brake repair, such as a leaking brake line or require routine brake repairs, we have you covered. Many of our customers have taken advantage of our popular front or rear brake service special, which includes the replacement of your vehicle’s front or rear brake pads or shoes, inspection of your car’s rotors or drums, a brake fluid level check, an inspection and adjustment of your vehicle’s emergency brake and a road test for safety. For our current specials on brake service or brake repair, click here.